Leaving Phnom Penhs coach station at 8am, the bus to Poipet stopped outside Pursat for a bite to eat after three hours, with still another 100 kms to Battambang, my own stopping-off point. We finally pulled into the Sorya bus office at 1pm with my friend and local guide, Sak waiting to greet me with a hug and a beaming smile. I booked into one of Battambangs newest hotels, the Golden Palace ($13 for twin room), some 200 metres from the east bank of the Sangker river and then took lunch, chicken curry, at the tourist-popular White Rose restaurant in the centre of town. As ever, the café was busy, the service was laboured though I did notice a resemblance of the heavily-pregnant female owner to Marina, the heroine of the childrens television show Stingray! I popped next door to renew acquaintances with Chhorvy, the friendly owner of the KCT internet shop. I took a shower back at the hotel and by 4pm was at Saks home, where he proudly showed me the concrete foundations and described his brand new house  one storey, two rooms  on land given to him by his parents, who live a couple of metres away. Work had begun twenty days earlier but will only continue when he has funds to pay the builder. Saks wife Theara cooked us pork and vegetables and we ate in the open-air in his garden, with his well-behaved children home from school and busy with their homework and chores. With his job at the town planning office, supplemented by a few foreign tourist-guiding jobs, hes been able to send them for extra tuition at a private school again. I was back in my hotel by 9.30pm and with two electricity power cuts in quick succession, I took the hint and retired to bed. Up at 6am, I had an omelette and coffee in the Green House café next to the hotel before a 7.30am start with Sak and his moto, as we headed for one of the small satellite railway stations. By 8am we had climbed aboard a norry  aka, a bamboo train - at Ou Dambang Mouy with fifteen locals and were rattling our way south towards our destination, Phnom Thipadei, on the way to the town of Moung Russei. I sat on a pile of rice sacks for protection against the bumpy ride and made friends with my fellow passengers as Sak kept a tight hold of his moto. Two oncoming norries were dismantled to let us pass because we had the moto but an hour and fifteen minutes into our ride, it was our turn to remove our wheels and wooden platform from the track to let through a convoy of five norries, loaded with goods and people. Just after 9.30am, we reached our destination, paid our couple of dollars and waved goodbye, as we headed for the top of the nearby Phnom Thipadei, eliciting surprised smiles from the quarrying families at the foot of the hill. Wat Sovann Kiri was at the top of a 300 step climb which presented us with wonderful views over the surrounding countryside and a welcoming breeze, though the colourful vihara at the top was locked with no-one around to open it up. It took another hour to reach Moung Russei town itself, arriving at noon and after a brief look around Wat Soriyaram, a brightly-decorated pagoda on the main highway with lots of statues in its grounds, we headed for lunch, chicken and pork, at a roadside stall. Around the corner we visited Thearas grandparents house and met a visiting relative from Long Beach, California, before stopping at Wat Chrey, located in a pretty setting alongside the river, at 2pm. This wat had even more colourful statues surrounding the vihara and a helpful monk, Kim Chea, showed us a killing fields stupa where one skull remained  the other victims remains having been cremated in 2001 on the orders of the head monk. Heading further east towards the Tonle Sap lake, we called into a couple of wats along the track, surrounded by bright green paddy fields and a smile on everyones lips. Nearly two hours into our ride, we arrived at Wat Daun Tri North, which turned out to be a fascinating location. Used as a Khmer Rouge hospital, Chhen, the old gentleman who guided us around, told us that bones often wash up out of the ground in the rainy season, when much of the area floods as the Tonle Sap lake dramatically expands in size. I spied a quartet of sandstone pedestals and Chhen confirmed the pagoda was built on the site of an Angkorean temple, Prasat Daun Tri. He took us inside the vihara, where a small sculpted antefix in prasat form in red sandstone stood on one side of the main altar. A space on the opposite side signalled where a beautiful carved stone with a thousand buddhas, in Chhens words, had stood until it was stolen at night by thieves just three months before. This raised for me the difficult conundrum about whether valuable items like that should be kept in their original location  which seems right  or moved to a safe location like the National Museum  which seems sensible. I am still debating this in my head! Meanwhile, Chhen wasnt finished and led us outside again to show us three sandstone lintels, one of which was in excellent condition with Indra atop Airavata, and a Sanskrit inscription. We thanked Chhen and the crowd that had joined us at the pagoda and headed back towards the main highway, about ten kilometres due west, stopping en route at Wat Ta Loas Chass to visit the elaborate killing fields memorial stupa in the grounds of the pagoda. The fifty kilometres back to Battambang took us just forty-five minutes as Sak put his foot down. I revisited the White Rose for my evening meal, KCT for my emails and a tikalok fruit juice at one of the foodstalls located along the riverbank. At 8am the next morning, Sak and I met up with an old friend, Tub Tan Leang, the Provinces director of culture and fine arts at the citys museum, where he explained in detail the contents of two stele, or inscription stones, including one from Daun Tri, which wed visited the day before. I also spotted that two lintels and one linga were absent from the display and he said theyd gone with an Angkor exhibition to Europe. He agreed with my suggestion, that a photo and explanation about their absence was a good idea to help visitors. At 8.30am, we headed south of the city, along the river, to investigate three villages that have been designated community villages in a drive to improve the tourist options around Battambang. Our first stop was in Ksach Poy village, ten kilometres from the city, which is being promoted as an agricultural area. We took the back road, making sure the river was always in sight and stopped for a chat with a farmer and his wife, who were growing a variety of foodstuffs on their plot, including corn, potatoes, oranges, grapefruit, mango, jackfruit, banana and coconut, having bought their hectare of land for $10K just four months before. Our other reason for visiting the village was to see the House of Light & Knowledge, headquarters of FEDA, where Sandy, the English teacher, showed us around their new and well-appointed facility for half an hour. FEDA is a grassroots NGO working to empower rural people in the area, they employ fifteen staff and no less than 700 children take advantage of the three classrooms, library and other facilities, at one time or another. At another stop, mainly to evade the incredibly dusty road, we called into a womens handicraft centre where we watched them making sarongs and they laughed at my feeble attempt to work the loom. On our way back to the city, we passed through Kompong Seima, another agricultural and fruit-growing village but decided to stop in the village of Watkor, where at least five ancient or traditional wooden houses are open to the public. The house we viewed wasnt exactly ancient, built some sixty years ago, but the female owner was very welcoming and showed us around her sturdy home on stilts and some of the older objects like a rice machine and ox-cart that were in her courtyard. By 11am I was back, checking my emails at KCT, followed by lunch at the White Rose and then back to my hotel for a short nap. At 2pm, I returned with Sak to the museum to spend a couple of hours with Tub Tan Leang, where he took me on a tour of his favourite pieces in the museums collection, giving me their history, provenance and how theyd arrived at the museum. He also opened up the museums storage area for me to see where numerous pieces are kept that arent quite up to display standard. Judging by the cobwebs and large spiders on show, its not an area that is opened very often. Leang is a man who clearly loves his work and it was a pleasure to spend time with him once again. Sak and I enjoyed a tikalok at the riverside as dusk fell and followed that with a 6.30pm dinner appointment with his family at the KO restaurant, close to La Villa hotel and the east bank of the river. Our party of seven  myself, Sak, Theara, as well as their children, Chamnap, Chakrya, Borromey and Holly - were seated some way from the stage where five singers and a band did their level best to burst our eardrums, making conversation virtually redundant. Nevertheless, our meal, various dishes and cans of soft drinks, was tasty and cost just $15. The meal was my thank you for the hospitality his lovely family show me whenever I come to Battambang. We finished the meal by 8.30pm and I returned to my hotel room to watch football on the tv. You might just get the impression that not much happens in Battambang after 9 at night. For my final day in Battambang, we decided to head north to visit some of Saks relatives in Monkolborei. After breakfast at the Green House café, we left the city at 8am, along the main highway towards Sisophon, with the railway line running in parallel alongside us. After forty-five minutes, we stopped at the main wat in the small town of Tapoung for directions to the two temples of Prasat Sel Nguor; backtracking three kilometres before heading west along a dusty track for another three kilometres. In the village of Tuol Prasat, we were shown the site of an old prasat, likely Prasat Sel Nguor East, where just a few sandstone and laterite blocks and a pedestal in the bushes remained and were told that four temples in the area had been completely destroyed during the Khmer Rouge regime. We scouted around some of the homes in the village, which houses thirty families, but without success apart from spotting a few more scattered sandstone blocks. Back on Highway 5, we arrived at Banteay Neang at 10.30am and walked up the steps to the pagoda behind the large Buddha statue, where a nun showed us a small collection of human bones found when clearing a well, and a Sanskrit inscription on the side of a large boulder, one of many which provide a series of caves full of small shrines. We rolled into Monkolborei town at 11.15am and headed straight to the village of Phasysra, where Sak had lived as a boy with his fathers relatives for four years during the Pol Pot regime, a stones throw from the Monkolborei river. Warmly welcomed at two houses, where at the latter, his aunt was making rice wine, we drove to nearby Wat Anchan, where Sak explained hed lived for a while and was forced to destroy Buddhist statues by the Khmer Rouge cadres, and severely punished after he ran away, being locked inside a burial stupa for two days. Our lunch was provided by his sister in law and her husband, Nouv and Jantou, and their adorable daughter with a delicious chicken curry, prepared especially for me. Once again, I was truly touched at the great lengths people go to make me feel so welcome throughout this wonderful country. On the way back to the main highway, we stopped at the site of Prasat Preah Srei, located behind a school, where a few sandstone blocks, a broken colonette and a pedestal were all that was left of an Angkorean temple. By 3.30pm we were back in Banteay Neang and took a look at a small hill, Phnom Thom Prasat, where we found a few pieces of sandstone and a circular pedestal, sat next to a newly-painted blue pagoda. We were back in Battambang just before 5pm. A little later, and fast becoming a creature of habit, I called into KCT and the White Rose and then visited a friend of Sak who showed us around his house, which he was looking to let, with Sak acting as landlord. I was tucked up in bed a little after 9pm. Next morning, I was up and packed by 6.30am as Sak arrived and took me to the boat-dock for my 7.15am departure. Hed purchased my ticket for a few dollars under the usual $15 tourist fee and after saying our goodbyes, myself and thirty odd passengers, a mixture of locals and foreigners, left the dock on our Angkor Express boat bound for Siem Reap, and the next chapter of my adventures. Battambang's finest: LtoR (back row); Theara and Sak; (front row) Chamnap, Holly, Chakrya and Borromey. 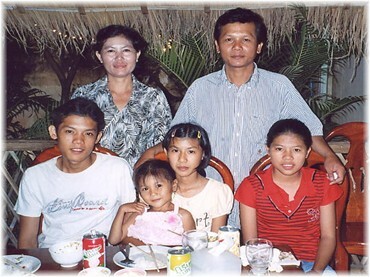 Let me introduce you to my friend Sak and his family from Battambang. In the last couple of years, Sak has become a very close friend of mine and I love spending time with him and his adorable family whenever I'm in Cambodia's sleepy second city. I spent a few days there in January and the above photo was taken at a restaurant where we went for my goodbye meal. It was the KO music restaurant on the east bank of the river, the food was pretty good, it cost less then $15 for the 7 of us, the singers and band were pretty loud though (what did I expect, this is Cambodia) and the company was great. I can't praise Sak highly enough as a guide and moto-driver, and of course as a friend. He was so excited when we met, as he couldn't wait to show me that the foundations had been laid for his brand new one-storey, two-roomed home. This is a major milestone in Sak's life, which hasn't been an easy one by any stretch of the imagination, and for him, he was overjoyed to be able to share his good fortune with me. I had timed my visit just right. I had a great time in Sak's company for a few days, including visiting the village of Phasysra, near Monkolborei where he was forced to live during the Khmer Rouge regime. And of course, I recommend anyone who is visiting Battambang, to contact Sak beforehand as he'll gladly act as your guide and driver. His knowledge of Battambang and the province is second to none. More details here. I couldn't resist posting this picture. It brings wonderful and poignant memories flooding back. It was taken just before I demolished a plateful of chicken curry cooked by this little girl's mother in a small village on the outskirts of Monkolborei, in northwest Cambodia, in January. We'd been playing catch for the previous ten minutes and her prize for not dropping the ball was a 50 riel note, which she held onto for dear life. It was at the home of my guide, Sak's sister-in-law and husband, Nouv and Jantou. And just around the corner from Wat Anchan, where the Khmer Rouge had held Sak as a child during their genocidal grip over the country and forced him to smash religious artifacts and Buddha statues. January 2007 marked my 13th trip to Cambodia since my first-ever visit in 1994. It's a country that has a special magic all of its own and which draws me back every year to venture out into the Cambodian countryside in search of new adventures, ancient temples and to catch up with the friends I've made from previous visits. Each trip is full of laughter, smiles and a host of fresh experiences and my latest expedition was no exception.